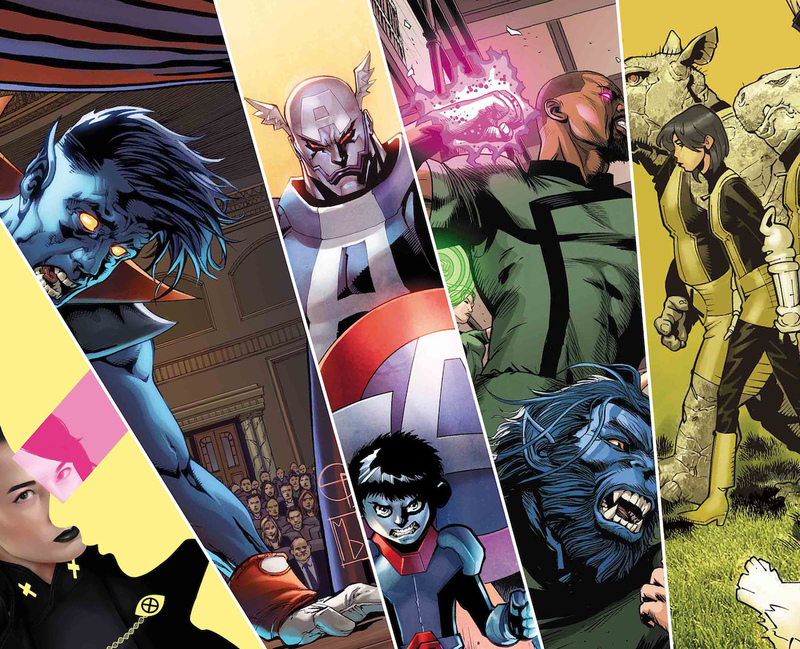 6 big takeaways from Marvel Comics' June 2019 solicitations – AiPT! Seven Star Wars comics, Captain America Apocalypse, and more. Solicitations allow comic shops and fans to peer into the future and begin to see what their favorite stories will bring. Complete with cover art, the short summaries give insight and can sometimes spoil things if you’re clever enough to connect the dots. After perusing the March solicitations for comics out in June here are my six big takeaways. Tony Stark: Iron Man, Daredevil #7, and Fantastic Four #11 are getting Galactus variant covers to celebrate Kurt Busiek and Alex Ross’ Marvels, which debuted 25 years ago. The Daredevil cover is by Leinil Yu, the Iron Man cover is by Clayton Crain and the Fantastic Four cover is by Nick Bradshaw. Beautiful covers. Probably the biggest shocker to come from these solicits is Apocalypse wearing the Captain America outfit. Not only is the design crazy cool, but he even seems to have a sidekick like Bucky! Other news includes Bishop on the verge of losing his mind, and Nightcrawler potentially bleeding out. It’s going to be an intense month for Age of X-Man fans. Some X-Tremists want to know love. Some X-Tremists want to know freedom. But some X-Tremists… just want to watch the world burn. The students must confront the truth behind their reality! What must they sacrifice for freedom? Perfect is an idea…an idea that by its nature does not fit into reality. The X-Men have seen the truth of a perfect world. That world is coming apart at the seams. The walls begin to crumble around the inmates! Can Bishop keep his sanity long enough to break free? IT’S CURTAINS FOR KURT WAGNER! Nightcrawler’s life hangs in the balance as the Age of X-Man crumbles around him! Plus: The fate of baby TJ revealed! It appears Rachel Summers is back and may even be sporting the Phoenix (although sometimes covers can’t be trusted). It also appears Cyclops’s quest to save mutants might be a touch harder as a vaccine is being created to stop mutants from occurring in all future generations. Yipes. X-Force is split between a Stryfe and a hard place! Plus: The return of Rachel Summers! If the solicit has anything to say about it I think a lot of folks will be buying Savage Avengers. Not only is this new super team going to be fighting wizards who “summon a death god from celestial hell” but it also has Wolverine giving his blood to an Avenger who might change from it. Plus, Conan is in this series. What the heck!? I’m excited. There are, by my count, 21 War of the Realms comics between the main title or tie-in issues. That’s a lot of War of the Realms! It also finishes up in June with War of the Realms #5 and #6 both being released this month. From the solicit it appears Venom, or at least a Symbiote related character, will be a huge factor in the finale. Curious. Taking place after Luke Skywalker learns his dear old dad is Darth Vader, Pak is showing us a time when Luke knows the horrible truth but must prepare for the inevitable battle between them. Over in the Darth Vader special, Pak is focusing on how Vader isn’t necessarily the ruler of the Grand Moffs and will show us how that power struggle plays out. There are seven total Star Wars comics out in June, which includes long-running series Doctor Aphra and Star Wars, Dennis ‘Hopeless’ Hallum’s excellent Vader – Dark Visions, and also the third chapters in the yet to be released series Galaxy’s Edge and Tie Fighter. DARTH VADER may be the most feared man in the galaxy. But to the proud Grand Moffs of THE EMPIRE, he’s just the Emperor’s apprentice – below them in the hierarchy. But what fury burns in the heart of a SITH with such overwhelming rage when a mere Moff dares command him? And at what point does Darth Vader show them his true power? But when a rebel general’s mistakes lead to disaster and Luke must seize command, the DARK SIDE tempts him as never before. Featuring the eerie influence of THE EMPEROR! During the height of the EMPIRE, DOK-ONDAR hired an unlikely team to pull off an impossible score — to steal a relic out of the occupied HOLY CITY OF JEDHA. With FIRST ORDER troops now blanketing the BLACK SPIRE OUTPOST on BATUU, history may finally be catching up to the notorious procurer of the unprocurable. Guest starring fan favorite Outer Rim pirate HONDO OHNAKA! The traitors of the REBEL ALLIANCE have made their presence known! Will the heroes of the EMPIRE be able to salvage the mission and save the day? Counting the cost of her incorrigible thievery, sticky-fingered archaeologist DOCTOR APHRA is at the mercy of REBEL HIGH COMMAND. EXES NEVER MARK THE SPOT. A psychedelic nightmare triggered by the local flora — with a terror known as DARTH VADER! The fate of an entire world is in the hands of the REBELS! And even then, can anyone manage to escape the Scourging of SHU-TORUN? The cataclysmic end of KIERON GILLEN’s run on STAR WARS.